It is in itself a brilliant achievement to transform this complex religious-philosophical satirical novel from 1930s Moscow into a spellbinding opera. 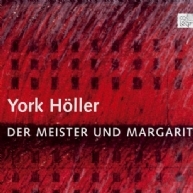 And each setting is imbued with its very special local color, whether it's Satan's ball, the asylum, the evil apartment, or the Place of the Skull: "Höller underpins, surrounds, conveys or impedes the sung and spoken parts by a dramatic theater music of powerful images and driving force, making use of the orchestral range of sounds both moderately and skillfully to maintain the tension throughout the master's sufferings about his Jesus novel, the devil's revealing interventions, the clarifying confusions staged by him and the surreal events at the writer's house, the evil apartment, the asylum, Satan's ball, the Place of the Skull and on the sparrow hills, and to provide each setting with its special couleur locale – a remarkable artistic accomplishment." (NZfM 2/2001) Lothar Zagrosek and IRCAM (electronics) were in charge of the production at the Cologne Opera recorded live for this CD: one hell of a performance by a brilliant ensemble! An opera? An anti-opera? A monodrama? Whatever it may be: Neither (1977) marks the meeting of the kindred artistic souls of Samuel Beckett and Morton Feldman. Gerhard E. Winkler explores the timeless, "archetypical" nature of relationship tangles: Heptameron, the pandemonium of human relations, as an interactive opera.